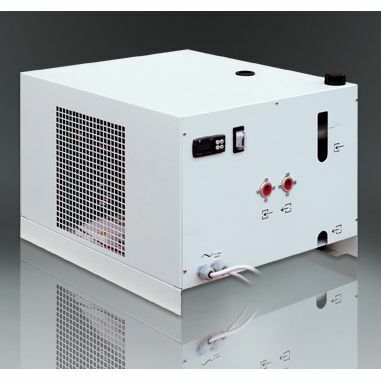 Water Chiller 1900Watt | DamenCNC B.V. Heavy Duty Water Cooler, also known as a chiller. This module has an integrated heat exchanger, like in a refrigator. This allows much more precise control of the spindle temperature. Als it can dissipate much more heat. Often used in in the bigger motors, in the range 5-10kw It also has a status output, this is a potential free contact(relay). We use this in CNC systems to generate an error and stop the milling spindle, in case the chiller unit is not working for some reason. Bronze / stainless steel circulation pump. High performance rotary vane or scroll compressors with low energy consumption. Tank equipped with top- up system and sight level. Protective metal frame made of S235 steel painted with epoxy powder and with a semi-gloss textured effect. Bypass on the hydraulic circuit.